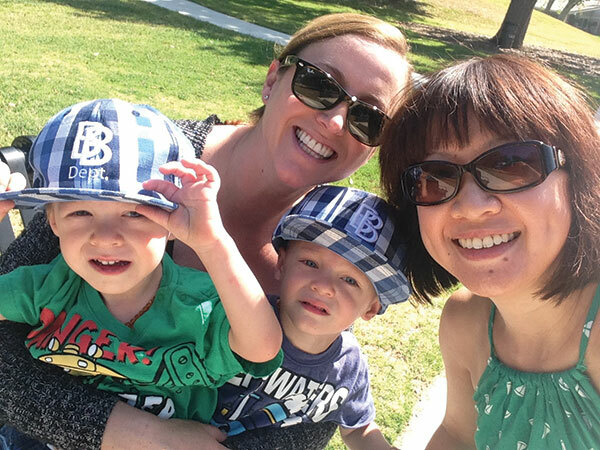 From Singapore, family friend Heather Teoh ’98 (right) set up a site to raise money for the husband and third son of Dianne (Habring ’97) Frehlich of Simi Valley. The first time Dianne (Habring ’97) Frehlich asked her best friend for help with a family crisis, Heather Teoh ’98 didn’t hesitate. Although Teoh, who’s from Singapore, was attending graduate school at Sacramento State University, she moved into the Frehlich home in Simi Valley, cooked meals, looked after the twins and generally supported her friend. Frehlich’s husband, Shane, had been diagnosed with acute myeloid leukemia just five months after the boys were born prematurely. The second time Frehlich needed help – a few months ago, when Shane’s cancer returned and their third son, Jonas, was diagnosed with Beckwith-Wiedemann syndrome – Teoh was living back in Singapore. Unable to respond in person, she instead turned to the Internet, setting up a fundraising account on a crowdfunding website and publicizing the family’s story via online social networks. “The Internet has certainly made the world a smaller place,” said Teoh in an email for this article. “Through the campaign and social media tools, we have been able to reach hundreds of people who have donated.” In two months, the campaign raised almost $23,000 toward Shane and Jonas’ medical expenses. Whether or not old-fashioned, hands-on assistance of the kind that Teoh provided three years ago is becoming any less common as a result, people today are leveraging new technologies to reach across distances, build community, and help friends and loved ones in need. In at least four recent cases, Cal Lutheran alumni facing huge medical bills as a result of illness or accident have accepted financial relief and emotional reassurance through crowdfunding. Friends of Gail Goepfert ’74, who has been in a wheelchair since an accident in 1995, are raising money to buy her a new Ford transit van through YouCaring.com. Alan ’72 and Tina (Cooper ’75) Virgil are using HelpHopeLive.org to get help for their son Aaron, 31, who was paralyzed in a snowboarding accident last year. Aaron is estimated to need $100,000 a year to pay medical expenses not covered by insurance. Andrea Dickinson of Nashville, Tennessee, has established a fundraiser on GoFundMe.com to raise money for her friends Brinden and Adam Wohlstattar, M.Ed. ’10 and ’07, college professors who earned their master’s degrees at Cal Lutheran. Adam has the rare neurodegenerative condition known as Prion disease. People have always gone to friends and family “to say I’m in trouble,” said Paul Witman, associate professor of information technology management at Cal Lutheran. But now, as a result of the social media craze and the ability to complete financial transactions online, crowdfunding enables them to cast a far wider net. “It’s an interesting space. It really extends the notion of how we can raise the value of a social network and use it to accomplish a good thing,” said Witman. In one month, the GoFundMe campaign established by Dickinson raised more than $71,000 for the Wohlstattars’ medical needs, after fees amounting to 8 percent of donations including credit card processing. HelpHopeLive.org, a registered nonprofit, also charges fees but allows donors to deduct donations in their taxes. It will give 90 percent of donations to Aaron and 10 percent to the Southwest Spinal Cord Injury Fund. So do the emergence and popularity of sites such as GoFundMe.com and YouCaring.com mean people these days are generally more willing to ask for financial help not just from family and friends, but also from complete strangers? And because it’s so easy to do, are more people willing to give money to someone they don’t personally know? “We’re social creatures, and it’s natural to want to help people who are suffering,” said Jose Marichal, a Cal Lutheran professor of political science and author of the 2012 book Facebook Democracy. The increasing reliance on online space, says Marichal, affects interpersonal relationships and wider social interaction in a variety of ways. Instant responses and “likes” make individuals feel recognized and appreciated, for example. The trend also has implications for service organizations and faith communities that have traditionally functioned as resources for those in need. As a news reporter, I have been asked to write about people facing financial hardship as a result of a diagnosis, medical emergency or accident. The number of such story requests has increased substantially in about the last 18 months, along with the crowdfunding campaigns that accompany them. That’s presumably not because more people are in trouble. Instead, the Web and social media are revealing what was previously hidden – the number of overwhelming challenges faced by individuals and families. Many people, including Frehlich, had never heard of websites such as GoFundMe.com before appearing on them. And until a crisis arrives, many people receiving aid have no idea how inadequate their health insurance coverage can turn out to be. I’ve seen that these campaigns are often accompanied by community fundraisers, held where the individual or family lives, that yield gifts of meals, babysitting and useful items. This kind of crowdfunding, which doesn’t offer financial returns for investors, is not something that could flourish in isolation. It feeds off established personal relationships, and it draws new people into the arena of actual human interaction. Ultimately, crowdfunding is powerful because it reveals that our trials, our hopes for loved ones, and our daily struggles are both ordinary and universal. Rachel McGrath is a professional journalist and broadcaster who lives in Thousand Oaks. She has worked as a senior broadcast journalist at the BBC and as a freelance correspondent and producer for media outlets including ITN, RTE, CNN Radio and Yahoo! Movies, and co-founded an independent entertainment news agency based in Hollywood.